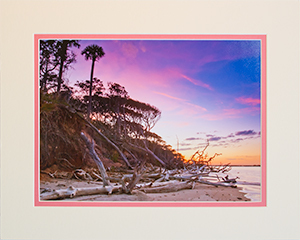 Big Talbot Island is one of the barrier islands north of Jacksonville, Florida. Overlooking Nassau Sound on the Atlantic Ocean is a bluff covered with oak trees. For thousands of years, storms have eroded the bluff, causing trees to fall onto the beach. 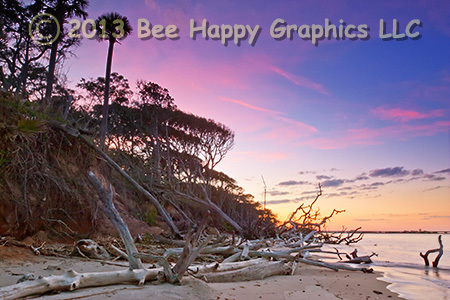 This picture was taken on that beach, also known as “Boneyard Beach”. It was taken just after sunset. Photographic details: Canon EOS 20D camera w/ 16-35mm lens set at 16mm, f/22 for 0.8 sec at ISO 400. Fine Art Paper 16" x 24" 17" x 26"
Canvas N/A 22" x 34"